The Hi K69 Radio Station, is a radio transmitter building located in Fort Carson, San Andreas, which appears in Grand Theft Auto: San Andreas. The radio station is not used for the main radio stations in the game, and the building itself is inaccessible. 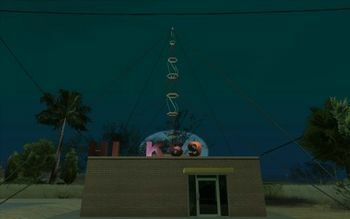 The name "K69" is one, of many, sexual references in the game. It is also the only radio transmitter in the whole of Bone County. This page was last modified on 28 May 2015, at 23:12.